Andy Beningo, named “Best Comedian” by the Detroit Metro Times, is a regular guest on the nationally syndicated Bob and Tom Radio Show. He has been heard on Chick McGee’s Off the Air Podcast, XM Sirius Radio, over seas on the American Forces Network, and on the very popular Daren Streblow radio show. 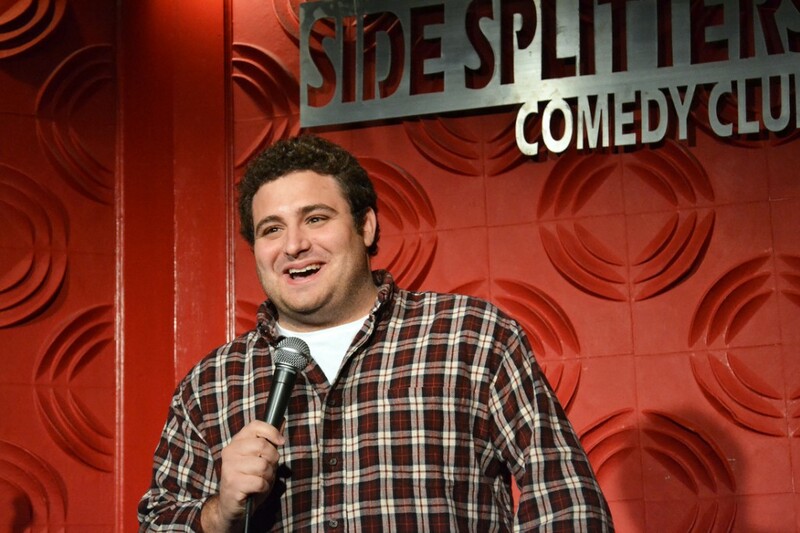 He has appeared on the AXS TV show “Gotham Comedy Live,” and was a final four finalist on CMT’s ‘Next Big Comic. ’ He has also performed on the NBC affiliate show, ‘Night Shift with Kevin Ferguson,’ Comedy Time Network, Comcast Cable and on MavTV. He became a favorite on Rooftop Comedy, where his material was highlighted on three different tv shows, including Comedy Cut Outs- an animated series. Rooftop also tapped him to host the National College Competition presented by TBS at both Michigan State and the University of Michigan. Recently, Andy won the Clean Guy’s Unbleepable Contest, and his stand up clip on text messaging premiered before Dave Coulier’s Clean Guys of Comedy movie- which was in over 600 theaters nationwide. His comedy festival credits include performances at Gilda’s Laugh Festival in Grand Rapids, MI (where he was the warm up act for Betty White’s sold out show at the DeVos Convention Center), the Detroit Comedy Festival, the Great American Comedy Festival (at the Johnny Carson Theater,) and the Clean Comedy Festival- where he won several awards. The Duluth Tribune raved about Beningo’s act, saying “he prides himself in clean material, and is extremely funny.” His energetic act centers around growing up as the middle child, his wife and baby, technology, fast food restaurants, and a short lived career as a middle school teacher. Now, Beningo continues to be a touring work horse- performing in 2100 shows through 37 states. He performs some 250 shows a year in corporate events, colleges, theaters, churches and casinos. He has performed in some of the top comedy clubs in the country, including Gotham Comedy Club in New York City, Zanies in Chicago, Comedy Store in Los Angeles, and nationwide in the Improv and Funny Bone Comedy Club chain. He regularly opens for MAD-TV star Frank Caliendo, and has shared the stage with some of his favorite comedians, including Dave Coulier, Rocky Laporte, John Heffron, Jimmy Brogan, Greg Giraldo, Jim Breuer and many more! In addition to stand up, Andy Beningo has starred in a very popular commercial for Pay Anywhere, and landed a small role in the film The End of The Tour starring Jason Segel and Jesse Eisenberg. He began working as a contributing writer on the very funny Big Funny Blog.